There’s a playlist for every occasion. There are the obvious workout, pregame, and homework playlists. There are the cleaning your dorm room, oldies but goodies, and internet-scoured mash-up playlists. There’s the guilty pleasure playlist that you can only listen to alone with the door dead bolted. Then comes the getting into the shower, getting out of the shower, and of course, the actual shower sequence (whoever invented the shower radio is a godsend). There’s specific music for when it’s raining outside so you’re allowed to stay in bed all day. There’s the road trip playlist that you have to roll down the windows while listening to and the newest playlist of four songs that gets played on repeat until you discover the next batch of four songs you just can’t get enough of. And then there’s the ultimate kitchen playlist—the only thing that can make garlic and onion hitting hot oil sound better. Cooking music can’t be too fast. You don’t want that overwhelmed feeling your mom had while listening to the blasting techno in Abercrombie as you tried on jeans. But cooking music also can’t be too slow. You want to be inspired to slave over the hot stove a little longer and turn that boring white rice into Butternut Squash Risotto with Pancetta and Pecorino. This playlist hits that magical in-between, and promises to be your newest and best kitchen accessory. 1. It’s OK—Cee Lo Green. I first heard this song in a lululemon store. If this song can keep women trying on spandex happy, it can also keep kitchen disasters in perspective. 2. Right as Rain—Adele. Biggest. Girl. Crush. Ever. It was hard to choose just one of her soulful songs. 3. No Taylor, No Scar—Norwegian Recycling. Jack Johnson, Missy Higgins, and Wyclef Jean in one relaxing mash-up? Gotta love it. 4. Iris—Boyz II Men. Originally by The Goo Goo Dolls, this version has made it to the coveted number one top played spot on my iTunes. 5. Coming Around Again—Simon Webb. Plain ol’ feel good music. 6. Starry Eyed—Ellie Goulding. It was hard to walk down my dorm hallway at school without hearing this song from one room or another. Oh…and she was the only live performer at Kate and William’s royal wedding reception. 7. We Are Okay—Joshua Radin. He could be singing the alphabet, but with his smooth voice, I’d still listen. 8. Send Me On My Way—Rusted Root. Cut to pancake making scene in Matilda. 9. Everybody Knows—John Legend. John Legend is the ultimate comfort music. Just what your small kitchen needs. 10. Love Keep Us Together—Martin Sexton. Most of my music taste has changed since 6th grade. But folkie Martin Sexton has remained a constant. 11. Run-Around—Blues Traveler. One of this jam-band’s most well-known and upbeat songs featuring a harmonica. 12. How Sweet It Is—James Taylor. The only concert my entire family has been to that everyone enjoyed. 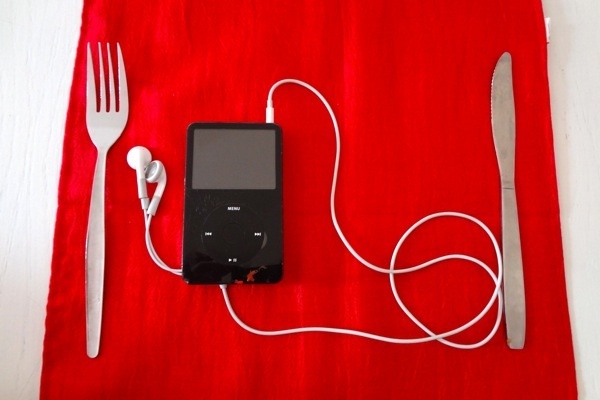 End with a slower song…and this cooking playlist can fade into an eating playlist. Lucy Dana is a junior at Duke University, currently spending the semester in Cape Town, South Africa where she is trying to muster up the courage to conquer the world’s highest bungee jump. Just downloaded all these songs and made a playlist…in the mood to cook now!!! I love to groove out while I cook, but I do not listen to any music with profanity. I really want to try out your playlist, but don’t know many of the songs–can you please tell me if they have clean lyrics or not? Thanks! Profanity is soulful. Get with the grove or get out, Mal. I love your image for this. Brilliant! Nice playlist, I love the incorporation of different types of music. I honestly hadn’t considered Blue Traveler’s Runaround to be a culinary or cooking song. I’ll listen to it differently now.